This mission is to send three or more Mun SCANsat satellites into The Mun's orbit, bringing back maps of Mun and data. The craft that will be used to launch is the Arrowel 2 and Arrowel 3, previously used in other missions. 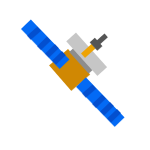 The orbit of the satellite will be different from each other, to generate the map in a short amount of time. Expected end of the mission is in August 2018. The first launch will be done on the 14th of January, GMT+8:00. The second and other launches will be announced soon. Mun SCANsat-1 successfully was deployed by Arrowel 2 into Mun Orbit on 14th January 2018. Below is the launch timeline. Else, we are happy to announce that other Mun SCANsats will be, hopefully, launched using the Arrowel III, the latest of the Arrowel series. The Arrowel III, however, is not a stock rocket and the SRBs are provided by SpaceY Heavy Lifters pack.